I’ve said it before, and I’ll say it again. Probably tomorrow. There are approximately 652 things to do each day to make sure that your kid just stays alive. If you add in any extracurriculars or attempts to eat organically, that number increases to like 986. And there are some days that I really feel like I’ve nailed it. Granted, they are few and far between, but some days, I just give myself a mental high five or tell my husband how amazing I did that day so that he can tell me how amazing I did that day. I didn’t yell at the kids today. Everyone ate their three pieces of fruit. No one bled or broke a bone or ran a fever. But recently, I’ve been really convicted about scripture memorization. I pray for my kids, I read my Bible and have my quiet time, we do a family devotional together every most a lot of mornings, but we don’t memorize scripture. 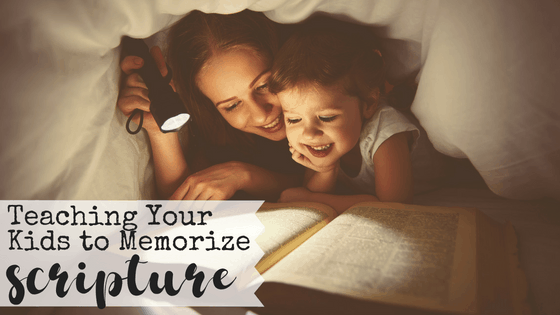 This post, How to Teach Kids to Memorize Scripture, contains affiliate links for your convenience. This means that if you make a purchase, we’ll receive compensation at no additional cost to you. Read our full disclosure policy. But the Bible is pretty clear that we’re supposed to memorize it. I know like ten verses?? It may be more, but I’m kind of afraid to actually test myself. So in recent weeks, I’ve committed to memorizing scripture along with my kids. They’re aged 2-9, so they still think it’s pretty fun. Our current method is mostly a lot of repetition and good old-fashioned competition. They want to be the one to memorize it first or say it the fastest or whatever pops into their brain that day. I use these giant Post It Notes and write out the verse on the very top. 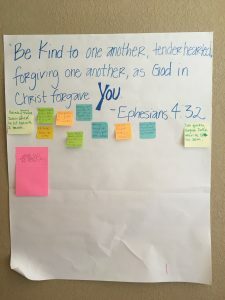 Then throughout the week, as the kids behave in a way that exhibits that verse, I write their actions on a tiny sticky note and stick it up there. And I ordered a ton of sticky notes for this activity. 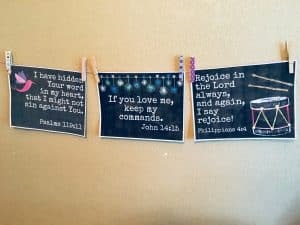 I showed them to the kids, and when they asked why I’d gotten so many, I told them it was because I’d need that many to write down all the ways they’re going to live out our Bible verses. They love that their good behavior is recognized, and they actually compete to see who can behave most like the Bible verse. I also hang the verses everywhere. Bathroom mirrors, kitchen cabinets, walls above their toys, the dining room, everywhere. I also put the verse on one of these cool letter boards (when I have time). And yes it takes some extra time on Sunday evenings to write out the verse and put the words on the board. But I think it’s worth it. Lastly, we color pages that have our verse for the week on them. We struggled to find a PDF that was intricate enough to keep our older kid’s attention, so we made our own. And not to brag, but they’re so good I sometimes print myself a copy and take a break from cleaning up the same mess over and over to just sit and color with my kids. If you’d like to get 40 pages free, click here to get to the download page. I think Psalm 37:31 says it best. I love the imagery in this verse so much because it’s so accurate. So many times when I make a mistake, it truly does feel like my steps just slipped. It feels like if I’d had a little better footing, or taken the time to place my steps more wisely, I’d never have made the mistake that led to sin in the first place. I want them to have hearts that are so filled with God’s word that they have steady feet as they walk through the world. This is what works for us right now. This might work for your family, or maybe it won’t. There are probably a million different ways that have been used to memorize scripture, and while some ways may be better than others, anyway is better than no way. So, try to teach your kids one verse this month because parenting is hard. Planting God’s Word in your child’s heart makes it a little easier. It makes them a little wiser, a little bit more patient, a little bit more kind. Day by day and verse by verse God’s powerful Word is working in their hearts in ways that my words can’t. What methods have you used to teach kids to memorize scripture? Tell us in the comments! 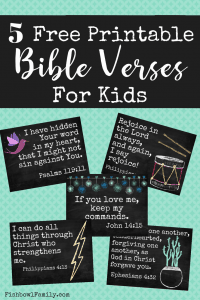 If you’d like to get a free PDF of five great Bible verses for kids to memorize, subscribe to our email list below!